Nitrofurantoin is an antibiotic used to treat or prevent certain bladder infections. It works by stopping the growth of bacteria. This antibiotic treats only bacterial infections. It will not work for viral infections (e.g., common cold, flu). Unnecessary use or overuse of any antibiotic can lead to its decreased effectiveness. The dosage and length of treatment is based on your medical condition and response to therapy. For children, the dosage is also based on the body weight. Take each dose with a full glass of water. Take nitrofurantoin with food. Take your doses at regular intervals. Do not take your medicine more often than directed. Do not stop taking except on your doctor's advice. Tell your doctor or health care professional if your symptoms do not improve or if you get new symptoms. Drink several glasses of water a day. If you are taking this medicine for a long time, visit your doctor for regular checks on your progress. 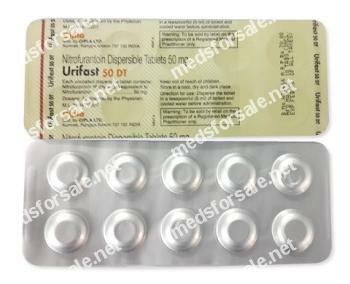 You should not take nitrofurantoin if you are allergic to it, or if you have severe kidney disease, urination problems, or a history of jaundice or liver problems caused by nitrofurantoin. Do not take nitrofurantoin if you are in the last 2 to 4 weeks of pregnancy. Before you take nitrofurantoin, tell your doctor if you have kidney disease, anemia, diabetes, an electrolyte imbalance or vitamin B deficiency, a genetic enzyme deficiency, or any type of debilitating disease. severe headache, ringing in your ears, dizziness, vision problems, pain behind your eyes. probenecid (Benemid) or other gout medications. This list is not complete and other drugs may interact with nitrofurantoin. Tell your doctor about all medications you use. This includes prescription, over-the-counter, vitamin, and herbal products. Do not start a new medication without telling your doctor. If overdose is suspected, contact your local poison control center or emergency room immediately. Do not share this medication with others. This medication has been prescribed for your current condition only. Do not use it later for another infection unless told to do so by your doctor. Store at room temperature between 68-77 degrees F (20-25 degrees C) away from moisture and light. Do not store in the bathroom. Keep all medicines away from children and pets. The prices are amazingly low. If you do not want to be ripped off buy only here. I placed two orders and received both on time as promised.